The Desert of Death is not a place that sounds like a desirable destination for most travelers. The Dasht-i-Margo, as it was known on the maps of the day, is located in the far southwest corner of Afghanistan’s Nimroz Province. In summer the region is the proverbial oven, a dust bowl. It is the area where the Helmand River disappears into a series or marshes and lakes. Nowadays it is a Taliban hideout and the focus of security forces guns. 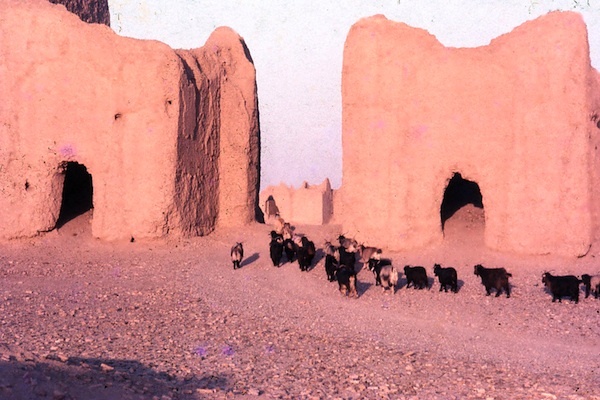 Back in the early 70s it was the most distant, inhospitable region of Afghanistan. In the spring of 1970 I set off with a friend to explore the area with the intention of seeing for ourselves the fabled ruins of Chakhansur. Having recently read James A. Michener’s Caravans, we were eager to see for ourselves the ruins built during the era of Alexander the Great and alleged to have been a city that ran along for more than a hundred miles! Now, keep in mind, I immediately knew the fault was ours. We should never have strayed into the backstreets without an Afghan guide to accompany us. The lesson being: know the territory, stick to your own set of rules, be respectful and be mindful of the people and of the culture. Really, do not try this yourself. Not in this day and age! So onward we went toward Farah,maybe five hour further by bus, stopping along at wayside chai khana for tea and kebabs as always, paying our respects at several of the shrines to saints and holy men along the roadside and resting quietly while the Afghans said afternoon and evening prayers. Turning off the Kandahar-Herat road at Delaram, we made it to Farah for the night where we had a shower, some palau and sabzi and nan for dinner and got a good night’s sleep at a government guest house. Next morning, early, we caught the “serwes” for Zaranj, and having no idea what lay in store en route we planned to jump from the bus when we reached Chakhansur. The day proved memorable and unsettling in more ways than one. Riding on the top of a bus is a great way to see the country whether in the mountains or desert. But the strangest thing is to be miles from anywhere in the desert, with nothing to be seen from horizon to horizon and come upon a traveler waiting for the bus as though there were a bus stop on the side of the road. Thus it was on the way across the Dasht-i-Margo. Standing, waiting patiently as our bus rolled up was a tall man, alone, carrying a large bundle. The bus came to a stop and with the help of the bus attendant the bundle was wrestled atop the roof. I watched from my perch seated upon a few similar bundles at the front of the roof, where I had the best view of the open road and the wind in my face. I wore a turban, or lungi, to keep the sand and grit from my mouth. I think the bundles I sat on contained grain as they were hard and immovable. 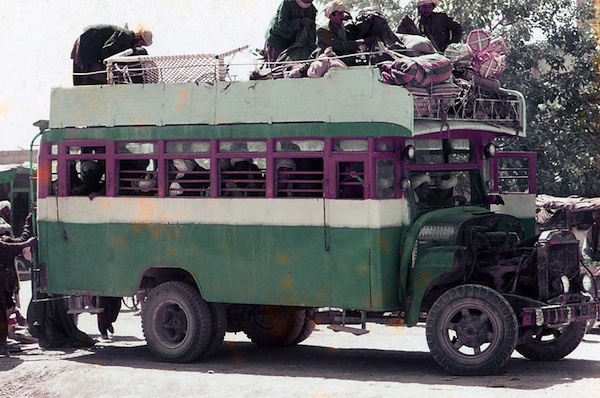 The turbaned, rugged Pashtun traveler boarded the bus via a ladder positioned at the rear and came directly to the front where I sat and without warning of any kind he slammed me with his right hip and dislodged me from my seat. I hit the deck with a jolt, confused by the act. My momentarily delayed response, paying no respect to his size, was to do much the same to the traveler with my left hip! Equally startled but settling in, at that moment the traveler turned to me and with a creaking guttural sound coming from the depth of his jaw, he drew his index finger across his throat and turned to face the road to come. “What have I done?” I said to myself… I made a vital effort to keep my composure but was in fact chilled to the bone with — fear? Yep. I quickly calculated that this man could – and would – kill me for assaulting his pride, manhood, place in society – I was a skinny hippie kid far from any town, road or source of safe haven. In short, I was toast, as good as gone, done for. I sat my ground and tried to enjoy the approaching scenery. Time and miles passed. And as suddenly as the bus had stopped to welcome this man, this force of nature, aboard, it stopped and he disembarked as oddly as he had arrived and taking his massive bundle shuffled off westward into the desert. I was saved. It was all a misunderstanding, a joke, a bad dream! 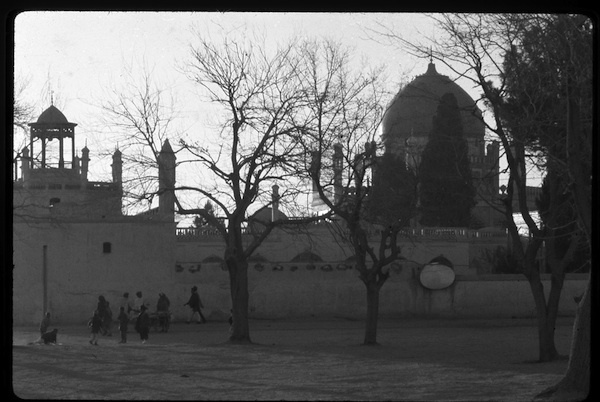 The bus moved onward, south by southwest toward Chakhansur as dusk approached and we left the Pashtun behind. Then almost immediately the road began a sudden and steep decent, following a curving path through a series of gullies and steep ravines. This continued for a while then the road leveled out and after passing an area of marshes we approached a village looming in the dusk that seemed to be from the time of Alexander – the town Lash-i-Jouayn. So, not even a slow half an hour down the road after discharging my would-be murderer from the bus we were stopping for the night. All I could think was that if this guy could walk the whole desert to board a bus, he could, in short order, sneak back into this village, find me and make good on his threat to slit my hippie throat. There were no government guest houses in Lash-i-Jouayn back in those days. Our bus stopped facing the “patio” of a simple chai khana, a tea house, with an open-air deck in front. It was already late and after a bit of nan and chai my friend and I rolled out our sleeping mats and turned in for the night. I waited for my demise calculating how to defend myself and disable my inevitable attacker and somehow live to tell about it. Ultimately sleep overtook me, and finally a cold desert dawn unfolded. Our journey continued. For the next several days we walked and photographed the endless ruins of Michener’s mystical desert, climbing through the sands and stones of a couple thousand years. In hindsight, they were certainly vast and mysterious, but without the trained eye and schooling of an archaeologist they were simply more Afghan ruins. And there were many more to be discovered. We managed to rendezvous with a return bus and made it back the route we had come arriving in Kabul after two crazy weeks on the old Silk Road. We were a bit more savvy for the experience and had learned a few lessons of the road in the process. Savvy travelers? Now there’s marketable phrase if I ever heard one!